With amazing views of St. John and Tortola. Step from your patio onto Sapphire's pristine, white sandy beach. Just a few more steps to beautiful, warm, Turquoise water. Enjoy your stay in Paradise. -Guest Lounge chairs are complimentary through the resort, attendant is located between the B and C buildings. Your lounge chairs will be placed at you chosen beach spot. -Our resort is 5 minutes from Red Hook - an amazing commercial strip where you can find restaurants, bars, grocery store clothing and gift shops. Our modern kitchen is fully equipped, Bedroom has King size Tempurpedic mattress. WiFi and cable tv are provided. We offer optional mid week cleaning and/or towel service, additional fees apply. Please book 2-3 weeks prior to arrival for guaranteed service. Sapphire's white sand and crystal clear water makes for one of St. Thomas's most pristine, inviting beaches. This particular unit has a perfect view that looks out in between the trees that dot the beach so that you can see St. John across the water. A short car ride or walk away you can find Redhook's nightlife scene or take a 15 minute ferry to St. John or other islands. Sapphire's own bar and grill is right next door where the friendly staff serves delicious food and refreshing drinks. Clear, calm water. Great snorkeling, Kayak and SUP or just lay on a floaty. Washers available at Marina. Need to purchase tokens. Dryers available at Marina. Need to purchase tokens. Optional Mid Stay Maid Service $50.00 Includes: bed linen change, fresh bath & beach towels, Kitchen towels light cleaning, replenish supplies needed and trash removal. Optional Mid Stay Towel Service $25.00 per 2 guest Includes fresh bath towels, beach towels, dish towels and trash removal Optional - Pack and Play Crib $25.00 Optional -VIP Taxi Service $200.00 This rate includes round trip airport transfer for up to 4 guest. Includes luggage and a stop at the grocery store on the way to condo. This fee is paid directly to the driver. Location, location, location! 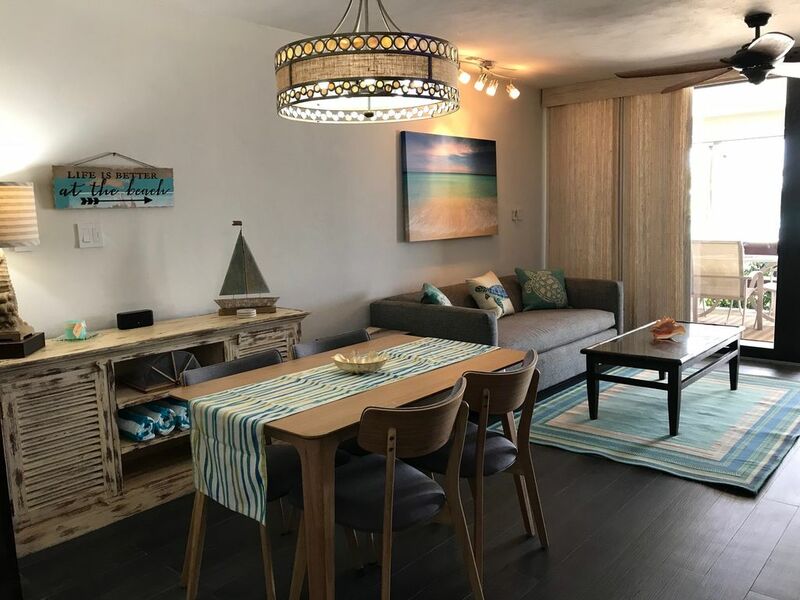 This is a beautiful condo literally on the beach! Owner and property manager are wonderful to work with. We had a wonderful 10 days in paradise! So happy to hear you enjoyed the condo and Sapphire Beach. Come back anytime, you two are awesome guest. Thank you for the great review.